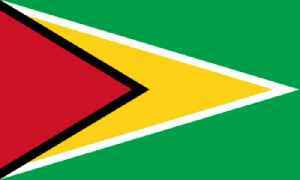 Guyana, officially the Co-operative Republic of Guyana, is a country on the northern mainland of South America. It is often considered part of the Caribbean region because of its strong cultural, historical, and political ties with other Anglo-Caribbean countries and the Caribbean Community (CARICOM). Guyana is bordered by the Atlantic Ocean to the north, Brazil to the south and southwest, Venezuela to the west, and Suriname to the east. With 215,000 square kilometres (83,000 sq mi), Guyana is the third-smallest sovereign state on mainland South America after Uruguay and Suriname.